I saw this lasagna in the April 2016 Better Homes and Garden Magazine and I knew I wanted to eat it “toute suit“. So I went ahead and bought ingredients and here we are. We finished everything in one sitting. For meat sauce: heat the olive oil in a large skillet over medium high heat and cook onions and bell pepper until soft (5 min). Add the garlic and cook 1 minute. and cook over high heat until meat is slightly browned, stirring from time to time to break up the lumps. Drain off excess fat if any. Stir in tomatoes, tomato sauce, Italian seasoning, fennel seeds, stock and enough salt and pepper to taste. Bring to the boil, reduce heat, cover and simmer 15 minutes, stirring from time to time. Set aside. Ricotta Filling: in a medium bowl combine egg, ricotta cheese and Parmesan cheese. Season with salt and freshly ground pepper. Set aside. Béchamel Sauce: in a medium saucepan melt two tablespoons butter over medium heat heat. Add the garlic and cook one minute. Remove from heat and gradually whisk in the milk. Return to the heat to the heat and cook, stirring constantly until it boils. Simmer, gently, stirring for 4 minutes. Remove from heat. Season with salt and freshly ground pepper and stir in Parmesan cheese. spoon 1/3 of the Béchamel Sauce over the lasagna sheets. top with 1/3 of the meat sauce. Sprinkle ½ a cup of the pepper jack cheese over the meat sauce. Repeat the previous step two times, starting with 4 lasagna sheets over the cheese and ending with a layer of meat sauce and 1 cup cheese. Cover the dish loosely with aluminium foil and ensure it doesn’t touch the lasagna. Bake 20 minutes covered, then remove the foil and bake a further 15-20 minutes or until the cheese is bubbly. Sprinkle parsley or basil and let stand for 10-15 minutes before serving. There were no left overs my friend…..
Preheat the oven to 375ºF (190ºC). 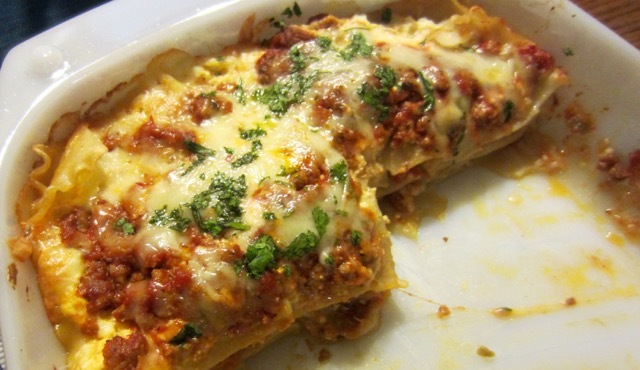 Cook lasagna sheets as per packet instructions in plenty of salted water, drain, rinse with cold water and set aside. For meat sauce: heat the olive oil in a large skillet over medium high heat and cook onions and bell pepper until soft (5 min). Add the garlic and cook 1 minute. 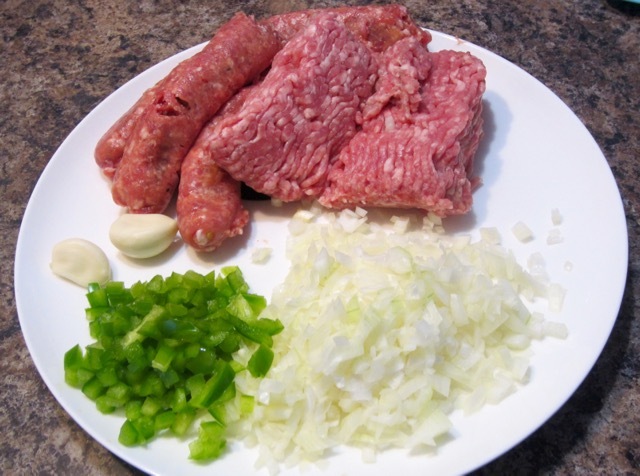 Add the ground beef and sausage meat and cook over high heat until meat is slightly browned, stirring from time to time to break up the lumps. Drain off excess fat if any. Stir in tomatoes, tomato sauce, Italian seasoning, fennel seeds, stock and enough salt and pepper to taste. Bring to the boil, reduce heat, cover and simmer 15 minutes, stirring from time to time. Set aside. Béchamel Sauce: In a medium saucepan melt the 40g butter over medium heat. Add the garlic and cook one minute. Stir in the flour and cook for 2 minutes. Remove from heat and gradually whisk in the milk. Return to the heat and cook stirring constantly until it boils. Simmer, gently, stirring for 4 minutes. Remove from heat. Season with salt and freshly ground pepper and stir in Parmesan cheese. Assemble lasagna: liberally brush a 9 x 13 dish with vegetable oil. 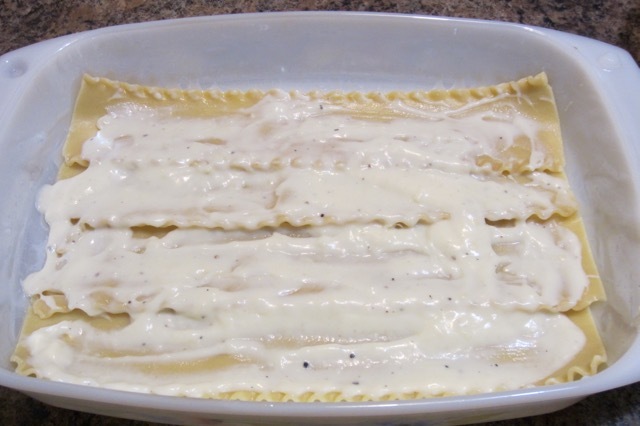 Arrange 4 lasagna sheets at the bottom of the dish then spoon 1/3 of the Béchamel Sauce over the lasagna sheets. Spread 1/3 of the ricotta filling over the Béchamel Sauce and top with 1/3 of the meat sauce. Sprinkle ½ a cup of the pepper jack cheese over the meat sauce. Repeat this step two times, starting with 4 lasagna sheets over the cheese and ending with a layer of meat sauce and 1 cup cheese. Cover the dish loosely with aluminium foil and ensure it doesn’t touch the lasagna. Bake 20 minutes covered, then remove the foil and bake a further 15-20 minutes or until the cheese is bubbly. Sprinkle parsley or basil and let stand for 10-15 minutes before serving. 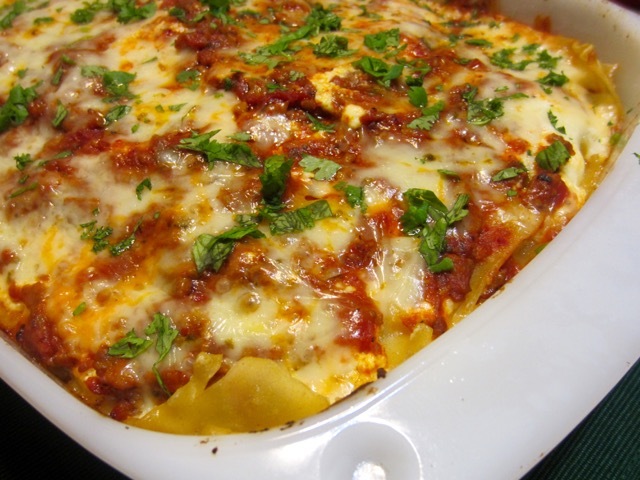 You can prepare and assemble lasagna ahead of time, cover with cling film and place in the fridge for 4-24 hours. Baking time will increase by 15 minutes. Oh yes. I haven’t made some since this one. I should plan to make this week! Wow!! Looks good. Comfort food at its best!! You should. I’m planning to make it again.